You won’t believe it. We came home from a long day on a photo shoot in Stellenbosch and Hannes found a beautiful specimen of snake in our drive way, curled up under the bakkie. He is very knowledgeable on snakes and was certain it was an egg eater snake, but it could also be a night adder. It was quite relaxed with Hannes’ handling, so he was certain it was a common egg eating snake. Common Egg-eating Snake (Dasypeltis scabra) Egg-eating snakes are a small group of snakes which diet only consists of entire bird eggs. They are fascinating snakes of which most are naturally restricted to the African continent. 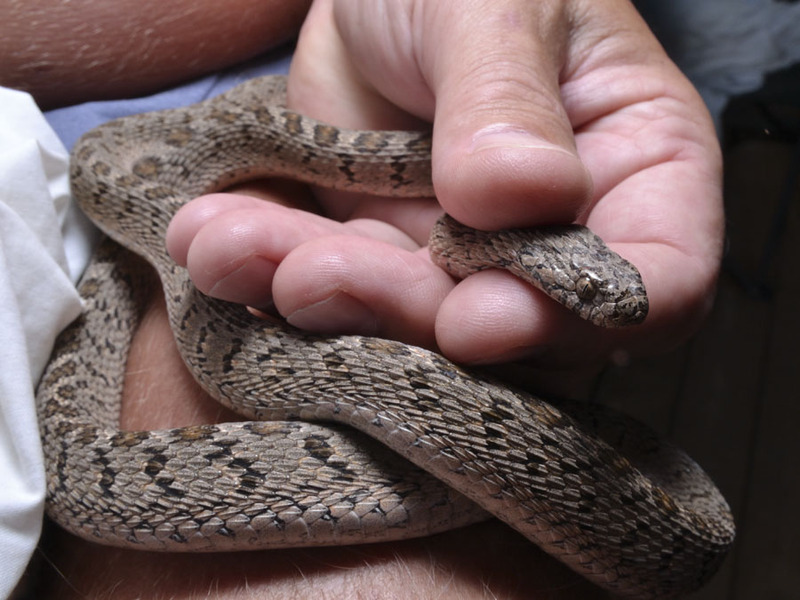 Common Egg-eating snakes (Dasypeltis scabra) are naturally restricted to most parts of southern Africa. They have slender bodies with heavy roughened keeled scales. The normal colouration of these snakes is grayish to grey-brown with darker rhombic (squarish) markings or blotches or chevrons (v-shapes) down the back. The underside is white, sometimes with dark spots or flecks. The inside of the mouth is black and there are no or reduced teeth present. A uniform brown variation without any markings, apparently called the Brown Egg-eater, is commonly found in the southern parts of South Africa’s Orange Free State. According to the literature these snakes are a bit smaller than Common Egg-eaters. When a nervous Egg-eater is agitated it will most often coil and uncoil its body in a horse shoe-like conformation, causing the lateral scales to rub over each other. This will cause a hissing-like rasping sound, much like the true hissing sounds of more dangerous snakes. At the same time it will start to lift its head and attempt to attack by striking out viciously with an open mouth. The lining of the mouth is very dark and the teeth are reduced or totally absent (although the subfamily Dasypeltinae makes up the solid toothed colubrids). Egg-eaters are kept more for their remarkable feeding habits rather than for its appearance. But with the chickens and the dove now part of the family, I would not think a snake would fit in, so we let it go. I know!! Never a dull moment! But I am lucky with Hannes knowing so much about snakes and things. The neighbours just kill them because they are scared of them. I haven’t seen many snakes, but there are alot in the wheat fields behind the house, so we have to be careful. Oh my God! That would totally freak me out if I found a snake in my garden. I am totally terrified of them (my one phobia!). Very lucky you are to have Hannes to deal with it. Hopefully they stay away from my garden – I don’t think Dexter will tolerate snakes slithering around (I hope! But your garden is SO interesting! Always something going on in it!